Startup B-Words: Here is my list of Startup B-Words for business building. Have productive fun thinking about how these startup b-words can contribute to your success. Treat them almost as though you were looking out of the window, blankly. You will be surprised how many reflections will be prompted by each one of the startup b-words—relating directly to your own plans. Barter (economizing): Direct exchange of merchandise and/or services between businesses. The entrepreneur’s own ‘sharing economy’. There are now business barter exchanges and the IRS makes helpful comments, too. Boostrapping (financing): Bootstrap Finance is building a business, with little or no capital. The entrepreneur uses revenue, imagination, ingenuity, and hard work, not finance. Bootstrapped ventures earn money—funded ventures spend money! Bootstrapping is among my favorite startup b-words—I practiced it to good effect. Bootcamp (beginning): Like raw recruits from civilian life who learn the military way of doing things, novice entrepreneurs can do a short intensive bootcamp to learn the rudiments of how to start a new venture. Blue Ocean2 (selling): Uncontested opportunity where less blood will be spilled than in a highly competitive situation (Red Ocean). Applies to markets for products or services. Price, cost, or process may be a critical factor, as well as innovative factors. See Blue Ocean Matrix among the Venture Founders Tools. Blue-Sky (deliberating): Creative ideas that are not limited by current thinking or beliefs, or examining possibilities, not only ‘outside the box’, but where there is no box at all. Brainstorming (creativity): Getting a group together of committed or uncommitted people to do formal brainstorming around an issue you’re struggling with. See Brainstorming among the Venture Founders Tools. Breakeven (loss or profit): Breakeven Analysis calculates the breakeven point: at the start profit seems the goal, but having a positive cash balance is what keeps you in business—focus of getting there safely. Brownbagging (meeting): Discussing ideas over a sandwich lunch with no formal agenda. Normally brownbagging involves blue-sky thinking or brainstorming. The subject is clear, but the objective not. Birdtabling (searching): Discussing something before any clear tasks or purpose beyond general notions have been declared. Any person can join the discussion and pick at seeds that have been rejected by others. Burger’s3 Five Elements (thinking): Five Elements of Effective Thinking, by Ed Burger, President of Southwestern University, Georgetown, TX—1. understand deeply; 2. make mistakes; 3. raise questions; 4. follow the flow; 5. change. Burn Rate (cash spending speed): A cautionary reason to keep your eye on cash flow daily at the early stages; running out of money can kill the venture next day. Have a look at Reducing Risk to Startup Safely. Business Model Canvas (planning): a tool that enables entrepreneurs to design, develop, articulate, challenge, invent and pivot their strategic business model. Deceptively simple. See Business Model Canvas among the Venture Founders Tools. 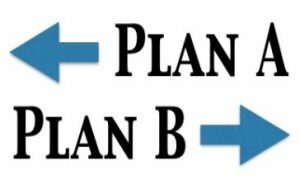 Plan B (pivoting): If Plan A seems to be heading nowhere, it may be time to think about Plan B. Many successful companies begin with one idea, but pivot, having learned through experience. “nothing ventured, nothing gained,” as the expression goes. Steve Blank whose formal definition of a startup is a “temporary organization in search of a scalable and repeatable business model”. See what Steve says about Plan B. You could play the game yourself, by seeing what startup b-words you can come up with. 3Author of Five Elements of Effective Thinking, President of Southwestern University, Georgetown, TX.